The aquaculture sector is highly developed in other parts of the world except in Africa. Different African governments have started to embrace the sector due to its potential to solve unemployment and contribute to the GDP. According to New Partnership for Africa's Development (NEPAD), increase in fish farming will help to meet market demand and bridge the gap of underproduction from natural fish stocks due to overfishing. 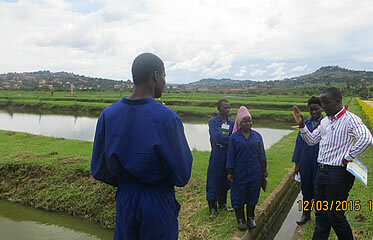 The initiative to make local fish feeds and formulation has stimulated the growth of the fish industry in Uganda. In Uganda, aquaculture has the potential to alleviate poverty and enhance sustainable development of the rural smallholders, the landless and marginalized groups.This is due to the ready market for the fish locally, regionally and internationally especially from the European Union. To contribute to the development and transformation of the underutilized fish production sector. To produce skilled graduates who are job creators in fish and related enterprises. Target group: Those interested in building attractive industrial, business, professional and service careers associated with the eleven programs highlighted above.